The problem with "unsigned long" is that it can have different size based on platform it's compiled on. Like @mfalkvidd says, use int32_t, uint32_t, int16_t and uint16_t which has a fixed width. BTW, is there a way to have the pulse meter running on gateway? I got stuck because at startup it asks the controller the last count value and since the controller is not yet connected it just doesn't work. What do you mean? And how do I keep the count of the pulses if I don't get it from controller? @hek is it me or the WATT readings are never sent? What could it be? Only V_VAR1 and V_KWH are sent. This will start up your code so you won't miss any pulses until controller is ready. You may ask for the last known Value in presentation(), then it will be fetched as soon as the controller is really there after startup. This could/should be combined with a bool pcReceived, so you may decide to either add the value received from controller to the counts the node meassured in between or just use the received value (starting from second time value is received from controller). Any more suggestions on the Watt issue? Did you by any chance change SLEEP_MODE to true? No, I get every pulse reported as soon as it is detected. Am I the only one using this sketch? 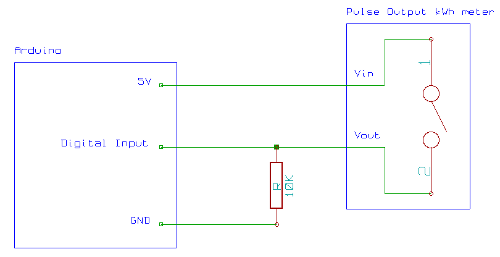 How is the pulse counter set up? Is it connected to the S0 port? If you are using S0 it is vital that you use a pull down resistor, if you dont’t have that you get false pulses. Could it be the Light sensor is triggering more interrupts from each pulse? I created this kWh sensor with the TCRT5000 IR Barrier Line Track Sensor. My powermeter is a ferarrismeter with 375 rotations per kWh. I also had the problem with spikes in the power usage. But after long...too long investigation I solved the problem. At my config it was a double issue. The problem is the pulse width of the rotation. The pulse are at night ( low power) much wider that during the day when more power is consumed. At night the spikes in power usage where huge. Switching on/off the halogen light causes spikes and related to also strange power measurement. I added a second arduino mini pro as a pulse regulator between the TCRT5000 and the power meter arduino. this arduino triggers on Rising and will always give a 100ms puls. Als debounce is handled (spikes). I don't upload the sketch here, I'm a beginning programmer on arduino. It's made on " trail and error" but it functions as it supposed to do. @gohan Did you solve this? I get very high watt usage as well. Sometimes like 40 000 - 130 000 watt if I check the serial monitor. Of course, those values will never be sent to the controler. Nope, I am looking at other things now. Very little time available for too many things. I'm looking at buying CT clamp and do a more direct measurement. Okay. Really annoying. Check this. The plus count seems OK, right? Here is my sketch. I use Home assistant so i created three sensors for this as I don't think V_VAR1 is supported with S_POWER. Otherwise it is the standard example. #define MAX_WATT 20000          // Max watt value to report. This filetrs outliers. BTW. First i tried the original example sketch, unmodified, with the same result. I think i solved this. I don't know if it is a good solution. Maybe it is possible to solve in the code? I added a 0,1uf ceramic capacitor between DO and GND on the LM393. Then i tuned the LM393 until i had it blink as expected. I think, in my case the LED pulse from my meeter was to short, it gives a very short blink. I tested it all day and it seems fine now. Are you getting instant power measurements correct? I don't have anything to compare with but i think it is accurate. Node send state every 20 sec. pulsecount: 8 pulses every 20 sec. 24 pulses x 60 min = pulses /hour = 1440. Now I get a new value every 20 sec, before I didn't get any value (W) from the node at all because it was too high. I only received pulse count and kWh earlier. Besides the cap, what exactly did you do? I use the same arduino, haven't uploaded anything new to it since i tried it last time. What I had to do was lower the sensitivity on the LM393 because at first the signal-LED glowed a bit but when i adjusted it to lower sensitivity and closed the door to get it totaly dark the led blinked exactly as the meeter. 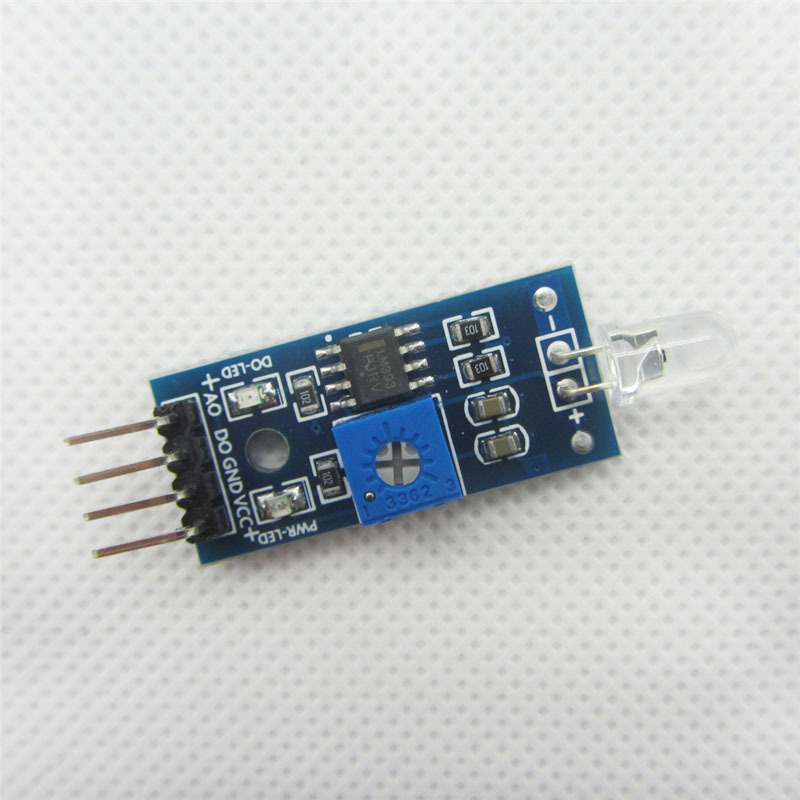 I have it on a bredboard and connected the cap between GND and to pin 3 so it is connected close to the arduino but i guess it shouldn't matter. I can't believe it, IT WORKS!!!!! I added the cap directly under the pins of the LM939 board. Thanks man! I am glad to hear it works for you too. It waswhat I thought too. As I said earlier, when I tested this my conclusion was, short blink, almost a flash will counted as a pulse (kWh) but it does something wrong with the calculation of instant power usage. A slower blink will correct this. My meeter gives a very short blink. Yes, could be that a simple debounce could do the trick but I'll have to look deeper into it. @Yveaux what do you think? @xydix Could you try to increase the 10000L to 100000L interval in the OnPulse function and see if it works without the capacitor? * to calculate/report watt value. #define SLEEP_MODE false        // Watt value can only be reported when sleep mode is false. #define MAX_WATT 1000000          // Max watt value to report. This filters outliers. 15000; // Minimum time between send (in milliseconds). We don't want to spam the gateway. The Problem ist, that only on Start the interrupt ist working once, but no LED blinks. @artipi using Serial.print and delay from within an interrupt service routine will mess things up. Interrupt service routines must be executed quickly. Since delay() requires interrupts to work, it will not work if called inside an ISR. You need to do the blinking inside loop(). Ah, this explains many things. Thank you, now its working:)! @artipi can you share your code? So i am trying to use this sketch with the sleep mode set to true 'cause i need to run it on battery. It works fine running with usb power on it and sleep mode on false. But with sleep mode true i am getting nothing in myscontroller after the initial startup. All i changed is the sleep mode from false to true. Running it on a clone nano with some chinese "flame detector" sensor. Been trying to figure out if it has something to do with how it reports when in sleep mode but it should still report whatever the send frequency is set to right? I was using a tv remote to fake impulses, with seems to work on usb power, but not on battery. In any case, the debug log from the node will give the best information on what is happening. It could also be useful to only change one thing. Right now you change sleep mode and switch to battery, right? How does the node behave with sleep mode on, but still running on usb power? How does the node behave with sleep mode off, but running on battery? @mfalkvidd , you are absolutely right. Let me clarify. I am using the example code that is under build and power meter pulse sensor, updated may 1st, 2018. Running it with "sleep mode = false" it works fine with both usb and battery power, just drains the battery quite fast. Setting it to "sleep mode = true" it doesn't work either on usb or battery power. Here's how the serial monitor looks for the startup phase with sleep mode as true. As far as i can see it seems fine and also shows up in myscontroller. And here is an example how it looks after 20 seconds sleep. I don't see any connection attempts with my gateway, or shouldn't there by any if the sensor is not triggered? Here i can show how it looks when tricking the sensor with the ir on the mouse. Interrupt is triggered and it wakes up, but nothing is sent to the gateway. The -1 in Wup=-1 indicates that the node was waken up by timer and not by interrupt. That’s very strange, since the time stamps clearly show that 20 seconds has not passed. to see if pulseCount is increased? @mfalkvidd , Here's the serial monitor after adding the serial print. As you see, it sleeps about 22 secs with no pulse on it. Moving the mouse over it gives this. Looking through the code, this one raises a flag. The pulseCount send is within that if statement which is not fullfilled because it doesn't receive pcReceived. Found a solution, which is not ideal. I was having similar problem with a motion sensor not being able to send, adding a delay after sleep helped on that one, but it was just a 5ms delay needed. On this one i had to add a 1 sec delay in the begining of the loop. I tried smaller but then it didn't work. I am starting to think it is the nano clone that has crappy components. I have two meters I would like to measure: One that the LED is off most of the time and briefly pulses on per increment (at 3200 pulses per Kwh - so I adjusted the pulse factor accordingly). This works fine. The second meter, the LED pulses off (meaning the led it lit most of the time, and pulses off briefly). Do I need to adjust the code in any way to deal with this meter? Thanks. Really impressed it works virtually out of the box. I think the sketch will work without modification. The easiest way to find out is probably to try it. Is there a suggested replacement for the TSL250? While it can still be found, it seems to be discontinued for the most part. I've had no luck with the LM393 solution for my new power meter. Just can't tune it to pick up the led impulses. What sort of diode solution is everyone else using? I'm aware of the possibility of IR communication (https://wiki.hal9k.dk/projects/kamstrup) but it seems a little over the top. my skectch works very well, only I have a double pricing, I manage to recover the information. but I have to modify the code in order to have my exact consumption. but my code sends me information always on the same IDs. Could you explain what double pricing means? Our electricity provider offers several rates. usually the HP/HC rate is programmed at night by the provider. @fullmetal cool. Thanks for explaining, and for sharing your sketch. In fact, my code does not work as I would like, HC information systematically go back to the HP ID.